The word "Chardonnay" has become synonymous with "white wine" here in California. People seem to buy virtually anything labeled "Chardonnay", whether the wines actually taste like Chardonnay or not. In fact, I often wonder whether the average bear can identify the character of Chardonnay. This is because many wines produced in California are subjected to so much oak, either in the form of real barrel aging or some sort of oak "flavoring" (new staves being introduced into a barrel or tank or oak chips or sawdust being added -- the laws don't require a winery to disclose this on the label) that an unwooded Chardonnay doesn't "taste" like Chardonnay to Yogi or Boo-Boo. Similarly, I have noticed that many tasters describe other white wines as being "Chardonnay-like" when these are dominated by wood. The Chardonnay grape was not treated like royalty until a few years ago. Old-timers such as Inglenook, Christian Brothers, Beaulieu Vineyards and Charles Krug made simple dry white wines of Chardonnay grapes. The Wente Brothers winery was thought to be at the vanguard of Chardonnay production, making a fresh, non-oaked dry white wine. In those days, Chardonnay was thought to be a relative of Pinot Noir and was routinely called "Pinot Chardonnay." It is, as it turns out, not related, so it's now called "just" Chardonnay. The first really important work in marrying oak with Chardonnay in the traditional style of France's Burgundian winemakers started with the Hanzell winery in Sonoma. This was back in 1957, when James Zellerbach imported French oak barrels for the aging and maturation of his Hanzell wines. Wonder of wonders! Oak!!! It's taken many years for winemakers to learn how to use oak in making wine. Some of them use oak as a crutch, propping up weak, thin wines and overloading them with wood. Others employ a combination of wood and residual sugar to give character to wines which are malnourished, wimpy wines. Many of these are quite popular, even "scoring" highly with those who claim expertise in judging wine. McDonald's hamburgers are quite popular, too, but few would say those are the best examples of beef on the planet. We enjoy a nicely oaked Chardonnay---don't get me wrong. I have been accused of liking the most woody tasting wines. I cite Napa Valley eno-scribe Bob Thompson who once wrote something like "My parents marveled that, as a boy, I ate the fruit and not the tree." He was poking fun at those who prefer Chardonnays with so much wood that determining if the beverage was actually made from grapes is impossible. The Chardonnay grape finds its home in France's Burgundy region, though it also is cultivated in Champagne. 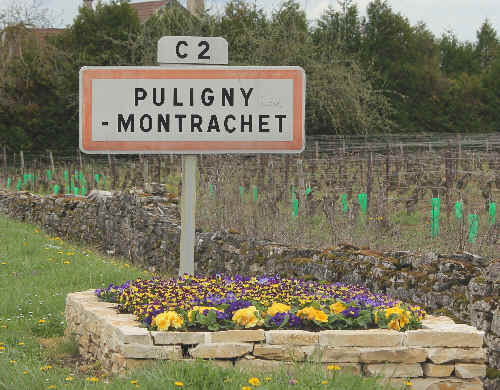 In Burgundy's Cote d'Or, the major appellations of Puligny-Montrachet, Chassagne-Montrachet and Meursault account for the top wines, but other villages turn out good wines, too. The best Cote d'Or producers barrel ferment the juice, using, at least, a percentage of new oak cooperage. The wines are often aged on the spent yeast and this sediment is stirred in barrel, contributing a toasty, smoky element to the wines. As the juice tends to be rather high in acidity, most winemakers induce a secondary fermentation (called a malolactic fermentation). This reduces the acidity and makes the wine rounder, creamier and somewhat buttery in character. California vintners make a full range of Chardonnays. At the low end you'll find wines from the "hotter-than-hell" Central Valley where tonnage is high and the intensity of character is low. On the higher end, you'll find wines from cooler, coastal climes, from low-yielding vineyards which can be sublime. Some wineries make light, crisp, "simple" Chardonnay, while others attempt to emulate the top wines of Burgundy. Some winemakers liken Chardonnay to a blank canvas. The character of the Chardonnay grape is dependant upon its origins, clonal selection, soil type, exposure, etc. The "seasonings" bestowed upon it during its maturation (oak, secondary fermentation, etc.) further determine the character of the wine. Some old clones of Chardonnay display a mildly appley note. Newer ones seem to have a more tropically-fruity quality. Diversity and individuality are what make winetasting fun and challenging. Don't fall into a rut! Be adventuresome and experiment with Chardonnays from different regions and unknown producers. We've long been fans of Pedroncelli's single vineyard bottling from the Frank Johnson vineyard in the Dry Creek Valley. This vineyard is actually along the border of Dry Creek and Russian River appellations. The Pedroncelli's have usually made a terrific wine from this fruit and each vintage is seems to improve. We've noticed they're using less American oak for the wine and they've increased the proportion of French barrels. The 2016 is delicious. The wine undergoes full malolactic fermentation and it's creamy and mildly toasty...lots of ripe apple notes with a touch of a spice note. Dry, of course. Post-Script: We stopped by the Pedroncelli winery in February of 2017...having visited a number of other wineries on our little tour, we had tasted a bunch of Chardonnays, all of them priced between $40 and $75. Ridge Estate Chardonnay, at $50, was the best of the tour, but Pedroncelli's Frank Johnson bottling was a winner, doubly so given its modest price tag. 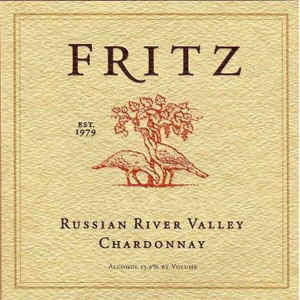 The late Jay Fritz was in the shipping business, once upon a time, and he started a little winemaking enterprise in the late 1970s. They began with much fanfare and made some really good wines back in the early days. Over the years they had some challenges and changes in winemakers which didn't "help." The past few years we've seen them get their sea legs back and a number of their wines are quite impressive and they have attractive price tags. The current Chardonnay is fairly big, with ripe fruit heading towards a hint of pineapple, melon, ripe pear and then having plenty of oak so there's a nicely oaky aspect. The Dreyer family have been in the wine business for several decades. They have a good sense of what makes a quality wine and they're sensitive to the price and value of a bottle of wine. With so many new brands hitting the market at remarkably high and frequently unjustified price levels, it's nice to find something locally-made from good quality fruit and carrying an attractive price tag. You can certainly find inexpensive white wines labeled "California Chardonnay" and you can find some Central Coast wines with modest price tags. We routinely scout these wines and many are made for "mass market" tastes (meaning fake oak and residual sugar). The Dreyer family doesn't seek out that market. They cater to adult palates and have a remarkably nice Chardonnay at a most attractive price. The wine won't remind you of a profound $50-$100 bottle of Chardonnay from Napa, Sonoma, Margaret River or France's C�te d'Or. It's made from Sonoma fruit, not Central Valley or Central Coast grapes. The juice is fermented in French oak, with 25% of the cooperage being new. As a result you'll get a hint of toastiness here, but it's not lavishly-oaked. There's a hint of ripe pear and a touch of wood in the background. Dry. Medium-bodied. Also: The Macon-Charnay of Manciat-Poncet is just $14.99. This is a delicious bottle of wine. No oak to speak of, but there's really nice apple-like fruit. Talmard's Macon is just $11.99...no oak...just good, simple dry white. And from the Chablis producer Lamblin, we have a Bourgogne Blanc for $13.50 which is made in the style of crisp, dry, lightly flinty, stony Chablis. WE TYPICALLY OFFER 5 or 6 CHARDONNAYS FOR SAMPLING IN OUR TASTING ROOM!